When only the best will do, Chocolate Perfection is the unique chocolate gift basket of choice. 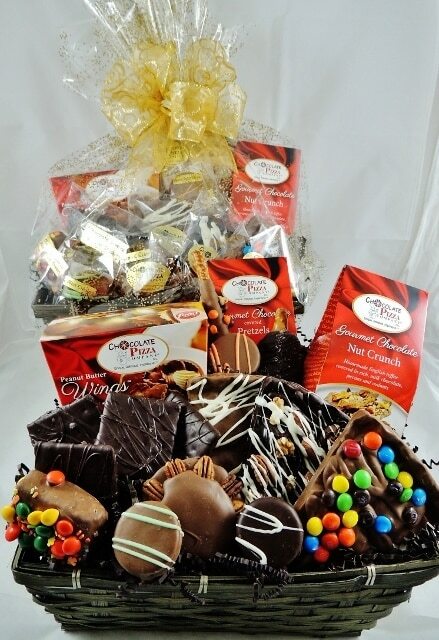 Loaded with a seemingly endless array of Chocolate Pizza Company’s best fancy chocolates, this Gift Basket will leave them speechless. 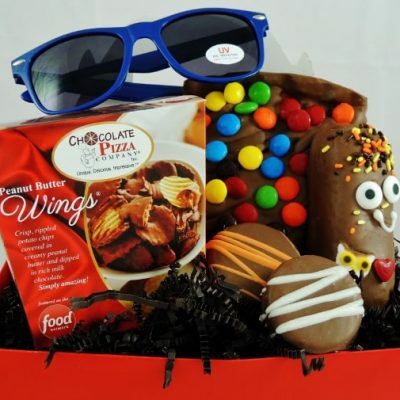 It includes our famous Peanut Butter Wings® (16 oz), chocolate covered Pretzels (6 oz), Nut Crunch (6 oz), 3 Chocolate Pizza® Slices (6 oz each), Peanut Butter Sparkler, chocolate covered graham crackers, caramel and nut Drumstick, chocolate covered puffed rice and marshmallow treat, pecan/cashew Cluster, 3 chocolate covered sandwich cookies. 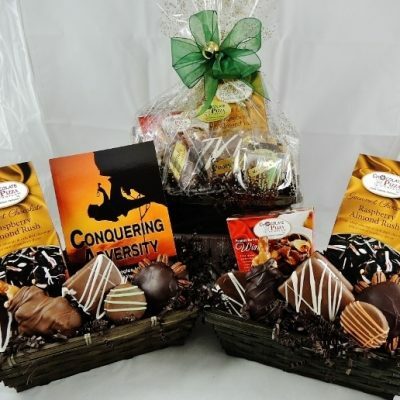 Beautifully presented in a basket with over-wrap and bow this gourmet chocolate gift is as impressive as it is delicious. One bite into any of our handcrafted chocolate masterpieces and you know that you’ve found the best chocolate ever. 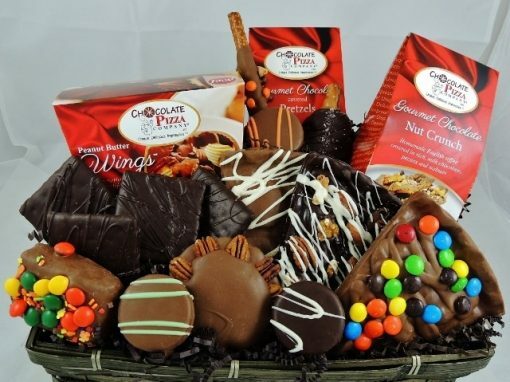 Our Best Chocolate Ever gift basket is pure chocolate perfection. It comes bursting with our favorite chocolate specialties including our famous Peanut Butter Wings® (16 oz), caramel and nut Drumstick, pecan/cashew Cluster, chocolate covered Pretzels (6 oz), 3 Chocolate Pizza® Slices (6 oz each), Peanut Butter Sparkler, chocolate covered graham crackers, Nut Crunch (6 oz), chocolate covered puffed rice and marshmallow treat, 3 chocolate covered sandwich cookies. 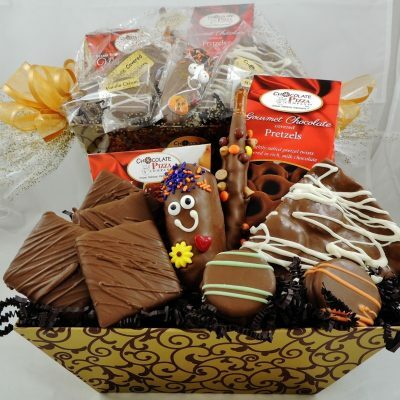 Beautifully presented in a basket with over-wrap and bow this gourmet chocolate gift is as impressive as it is delicious. The best chocolate ever is waiting for you to send to someone very special.